This week I’ll be discussing some recent Standard tournament results, as well as a few other items worthy of our attention. @OwenTweetenwald’s win in Albuquerque gave him back-to-back GP wins, an exclusive club indeed. He took it down with Mono-black, which was a popular theme over the weekend. Paul Reitzel, who placed 8th, tweeted this on Monday afternoon. It was a good weekend to be putting swamps into play. With a whopping four Mono-black decks in the top 8, alongside three Mono-blue, there was barely a Shockland in sight. What there was, though, was 46 Mutavaults in the top 16. That means that 71% of Mutavaults that could have been played, were played. This type of saturation of a single card in Standard is not common at all. I don’t even think Lightning Bolt reached that level of play when it was in M10 and M11 . Cards like Stoneforge Mystic and Jace, the Mind Sculptor reach 70% saturation rate. What that means for your weekend is that the roughly $20 price tag is going to be very stable going forward. The card is as legitimate in Standard this time around as it was last time, so don’t be afraid to pick up a playset. If this changeling presence persists, expect a price uptick in a few weeks when PTQ season starts in earnest, or possibly even sooner. While not nearly as heavily played, but still pervasive, Nykthos, Shrine to Nyx snuck its way into many of the Mono-X lists. Most were committed to the full set of Mutavaults, with a single Nykthos rounding out the colorless-land package. That is the current soup-de-jour, but could easily be turned on its head depending on how things shake out. A 4-1 split tells me the deck can support 5 colorless lands, and right now Mutavault is the better choice. How much would it take to shift that? Anything that pushes the deck to go a little larger would probably want Nykthos more than Mutavault. Anything with an X in the mana cost would certainly accomplish that. Rakdos’ Return? Gaze of Granite? Debt to the Deathless? Immortal Servitude? Mind Grind? Return lets “mono” black fireball out opponents, as well as apply heavy pressure in the midgame against control decks and attrition mirrors. As a mythic it is set up to see a healthy price increase should it become popular. Mind Grind is spicy, basically being lethal when X is around 15, an easy number for Nykthos-fueled madness to reach. Grind could conceivably hit $3, being that the card is still $1 purely on casual mill demand. This makes me think that Mind Grind may not be bad throw-in material. Even if it totally whiffs in Standard, Nemesis of Reason is a $6 card today. Even if nothing within the current card pool pushes the decks to go heavier on Nykthos, Born of the Gods may very well provide us with the necessary ingredients. We’ve got a lot of devotion enablers to go, as well as 10 lesser deities to appease, which means you’ve got plenty to be faithful to. With Cavern of Souls having been $20-30 in Standard, and Mutavault solidly at $20 right now with an expectation of growth, there is precedent for Nykthos to climb. We’ll return to it a little later on. Beyond the Mutavault supremacy, what else is going on? Mono-blue is still packed to the gills with Masters of Waves and Thassas. Both have slipped in price recently, but I expect this to be temporary. I’m guessing one or both will be over $15 this time next fall, when Theros is no longer the current major set. I’ve started looking for Master of Waves in every trade binder I flip through. Hero’s Downfall stubbornly remains at $10+. That a utility removal spell in a single format would command that high a price tag sort of amazes me, but I suppose when it’s the best removal in arguably the best color, it’s going to be more than pocket change. Perhaps I should be looking to Dreadbore to better understand how Murderbore will behave. Dreadbore has never managed to sink below $2-3, even with as close to zero relevant play as a card of that stripe could see. This would tell us that Murderbore’s floor should be about the same. If we think of Murderbore as having a floor of $3, then a $10 price tag while seeing play in nearly 50% of the top 8 decks doesn’t seem as unreasonable. I advocated selling a few weeks ago when it was $15, but I think it’s low enough that you could trade for a set without feeling bad about it. Given that it’s only one color, and therefore considerably more versatile than Dreadbore, it’s possible the number we get aggressive is around $6-7. The number of Burning-Tree Emissarys in Standard necessary to make Murderbore bad would be quite high indeed. The Naya deck in the top 8 showed that competitive Magic players haven’t forgotten about RtR block. It had a full compliment of a lovely singing voice, reminding everyone that at one point it may actually have been worth its current absurd price tag. At this point, if you still have any, I’d hold onto them. With the PTQ season around the corner, the card has a better chance of spiking again than fading away with no more price increases. Advent of the Wurm was also four-of, a card I’m still carrying a torch for. Perhaps more interesting was the four Soldier of the Pantheon. Everyone has figured out by now that the card is good, but his price is pretty low all things considered. I’d be looking to snap these up in trade right now at ~$2. Champion of the Parish was $8 at one point, and I’d say Soldier has a better chance of seeing Modern play. Boros Reckoner has been on a roller coaster ride lately. It was as high as $20 what feels like a week ago, and copies are available for under $11 again. I have to imagine this gets close to $20 once more before we sunset RtR. If you can trade for them at retail go for it, but good luck convincing someone they’re that cheap again. Over on the Starcity side of things, Matt Costa rose to the top of the field piloting a Jund deck. Reaper of the Wilds as a three-of immediately jumped out to me, proving its capability as a strong midrange card. Both Pat Chapin and Kibler had mentioned it recently, but without tournament results it was hard to know if it was real. I doubt the card is going to reach $10 or anything, but $4-$6 doesn’t seem unreasonable. (Were you aware Cyclonic Rift is now $4?) This is another one that I wouldn’t dish out cash for, but you should be able to steal copies in trade for $1 or less. Look for an article in the future about how to turn small gains in trade binder value value into real profit. Abrupt Decay was also out in full force. Can this card break $10 during Modern season? It may be tough, as the Standard PTQ season will have ended, and many will be willing to liquidate their inventory. Next Modern PTQ season should be a good time for Decay though. A few months ago I predicted that foil Decay would be $60 within one year of RtR rotating. Do you have your set? 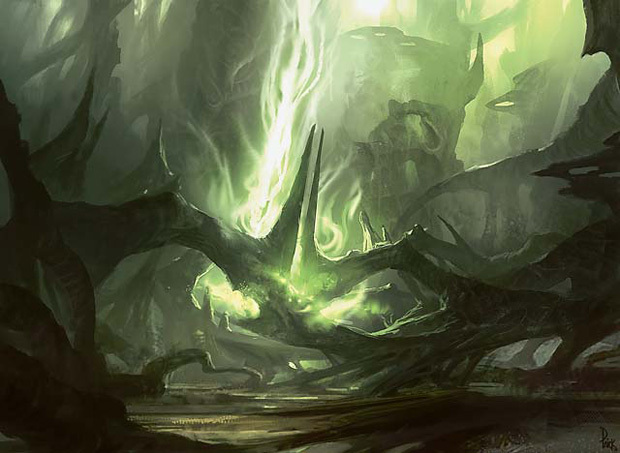 Back to Nykthos, last week I talked about a Modern Mono-green deck that looked awfully spicy. It was even one of LSV’s daily decks recently. Included in that same link from Bing Luke was a Mono-Black deck. Since then, Phyrexian Obliterator has increased about 25%, and common sentiment is that it probably isn’t done yet. Apparently, the Magic community is willing to consider Nykthos a real thing in Modern. With that in mind, I want to look at the green deck a little more closely. It’s got a lot going on we can be interested in. What stands out most to me is four Genesis Wave. Wave is about $2 on its own merit, with no competitive interest, putting it in a low tier of “casual cards with enough demand to raise the price above bulk.” If the deck catches fire, Wave could easily hit $5-6, and depending on how wild the speculation is, $10+ is possible, although that would be a very short term price unless the deck puts up results. That brings me to an important aside: cards spike all the time. The ones that stay high are the ones in decks good enough to be worth it. If a card like Genesis Wave spikes, sell immediately. The likelihood that the deck is good enough to support whatever number it reaches, rather than being a flash-in-the-pan that trickles to $3 eventually, is very very low. Beyond Genesis Wave, there are three copies of Primeval Titan. He’s sitting at around $6-$7 at the moment. Seeing play in a deck like this could bump him up closer to $10, and with Nykthos in the format, he may eventually become a little more of a mainstay. Fetching Valakut is typically a better use of his trigger, but remember that having Valakut in your deck doesn’t get P Tats into play any faster, while Nykthos does. Maybe we see a Valakut/Nykthos deck? Who knows. Cloudstone Curio is a big part of the deck as well, at $5-$6. The card popped to over $10 early this summer, so there’s precedent on a jump. I’d try and grab your set soon. Garruk Wildspeaker is also a major component, but he’s been printed six times, which will help suppress his value. He may see a small uptick, but with that much volume available, it will be tough for him to move too far. Before I go, check out this completed eBay auction. How many of you even knew these existed, much less cost that much? Well written article. I’ve been completely ignoring Standard as of late (just because I haven’t found a deck I like yet), so I appreciate being caught up to speed. I’m with you on the Advent of the Wurm bandwagon, hoarding 20+ copies wishing they would pull ahead to above $5. Thanks Doug. Time will tell on Advent soon enough, I suppose.